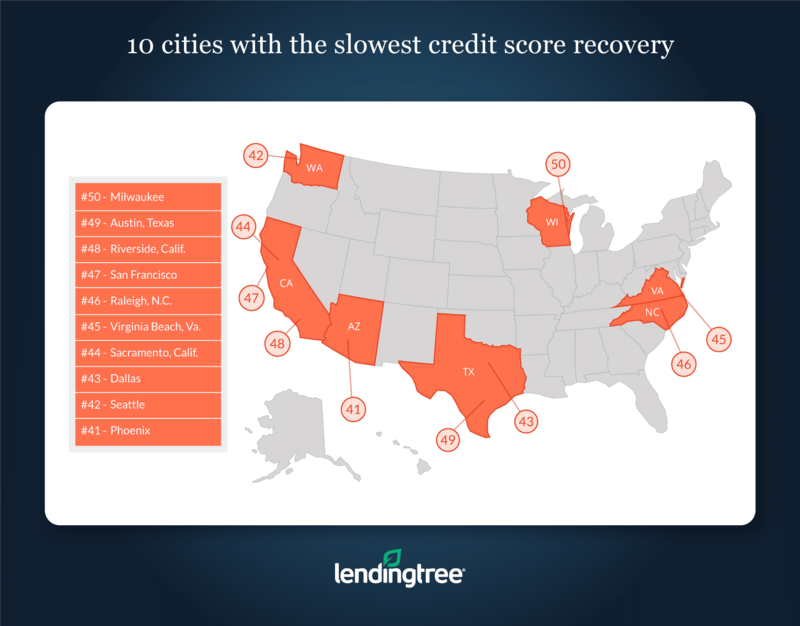 New LendingTree study ranks cities by how quickly credit scores recover after buying a home. A house is the biggest purchase most people make in their lifetime, with the accompanying mortgage being their largest financial transaction. Most people know they should work toward having the best possible credit score before applying for a mortgage, as an applicant’s credit score can significantly affect the amount and cost of borrowing. But what happens to your credit score after you get a mortgage? A new LendingTree analysis looked at more than 5,000 consumers who took out a mortgage and how their credit scores changed in the months following. Our study shows that scores initially fall, but eventually recover. Scores fall for at least 4 months. On average, credit scores fell by 15 points and took 160 days (just over five months) to reach their low points. Mortgages do not appear on credit reports immediately after closing. Typically, the mortgage lender starts reporting to the credit bureaus after your first payment and depending on the lender’s reporting cycle. Thus it may take about 60 days after closing or even longer for it show up and start affecting a score. New Orleans homeowners saw their credit scores reach their lowest points in an average time of 133 days, while Milwaukee homebuyers’ scores had the longest decline: 191 days. Recovery takes at least another 5 months. It took an average of an additional 161 days for scores to return to their prior levels. As borrowers make on time payments, their credit scores start to recover. In Richmond, Va., homebuyers’ credit scores rebounded fastest at 130 days, while the upward climb for homeowners in Austin, Texas, lasted 197 days. 11 months later, scores recover and are poised to move higher. The average for the complete decline and recovery cycle was 11 months nationally. Richmond homebuyers saw their credit scores go through the cycle the fastest (9 months) while the dip and return of Milwaukee homebuyers’ scores took the longest (13 months). Tight range of score declines. The average score fell the most in Virginia Beach, Va., down 20 points, and the least in Minneapolis at just 11 points. Individual credit scores in the sample declined as much as 40 points. When a consumer takes out a mortgage, a large balance is added to his credit report. Credit scoring models consider a consumer’s total balance of money owed, and a large increase in outstanding debt drives scores lower. The presence of a new credit line item also weighs on the score, though to a lower extent. As time passes, making on-time payments helps a borrower improve their credit score as they demonstrate they are managing their new mortgage account well. Having a mortgage also increases the diversity of accounts in the credit file, which also boosts the score. Eventually, the score returns to its pre-mortgage level and in most cases, surpasses it. As well as national data, we took a look at the variation in credit scores across the 50 largest cities in the U.S. These aggregate numbers give an excellent view of the effects of homebuying on credit scores. 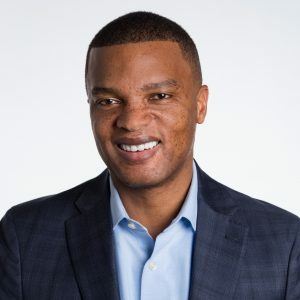 We used data from My LendingTree, a financial intelligence platform that can help consumers better manage their financial health. There’s nothing you can do about the effect your new mortgage will have on your credit score, but you can focus on other areas of your credit profile to make sure your score doesn’t fall further. Avoid applying for new credit and keep your credit card balances low. This could be a challenge — you’ll have moving expenses and a new house to furnish — but using as little of your available credit as possible is key to improving your credit score. The closer you get to maxing out your credit cards, the more your credit score will drop. And, of course, make sure you make on-time payments for all your debts. To determine how homebuying affects credit score, we used LendingTree’s proprietary financial intelligence platform, My LendingTree, to look at over 5,000 consumers who bought homes in 2015 and 2016. 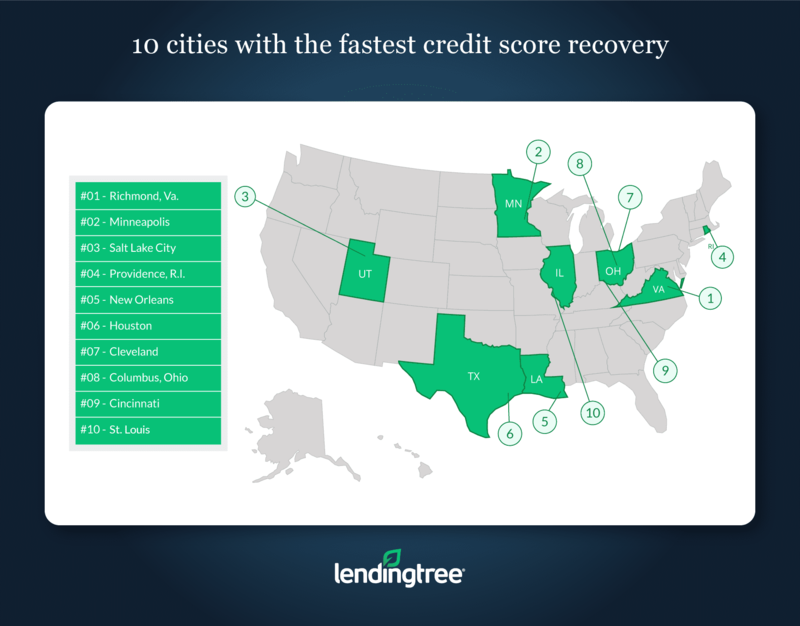 My LendingTree tracked credit scores from the when borrowers took out a mortgage until the score returned to its pre-mortgage level, and aggregated for each city. Our definition of cities is from the Census Bureau’s Core-Based Statistical Area (CBSA) boundaries.